Fly fishing is an amazing past time, and it’s certainly one of the most impressive visual spectacles that you’ll find in any kind of fishing period. A lot of amateur anglers begin to realize that fly fishing isn’t as simple as it looks when they begin to study out the equipment used and realize how much different it is from their standard fare however. We’re here to dispel the mysticism surrounding this exciting sport and help you pick a best fly fishing rod you can count on. 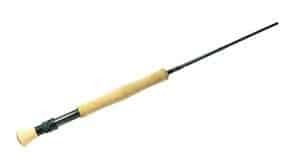 Due to the differing nature of the cast, fly fishing rods are specialized pieces of equipment. In addition to holding the line straight with guides, like any other pole, they also have to be able to apply some more precise control to the fly once it’s on the water. Fly rods tend to be rated a little bit differently from the most standard spinning and casting rods. The size of the fish matters even more to your equipment selection than normal, and you’ll want to match the “rod weight” to your targeted species. For most beginning anglers, something in the range of 5-9 weight is most appropriate. That’s about the size you’d want for largemouth bass. The rods go up to 14, which is more suitable for marlin or other larger oceanic fishes, and down to 0 which is probably best for those who are looking for small panfish. For the person just getting into the sport, the action can be a primary consideration as well. Those who are looking for shorter casts will want something with a slower action, slower action rods are also ideal for fishing in streams. Rods with a faster action have a bit less flex to them and tend to be somewhat easier to use in windy conditions due to the stiffness of the rod itself. For the amateur, something with a medium action and a line weight of 4-6 is probably the best way to go, more experienced anglers will want to look at the exact line weight and action they want in order to match things perfectly with their intended prey. This fantastic offering from Okuma comes in with a pretty moderate price considering what you’ll get out of it. Graphite has replaced fiberglass as the ideal pole material in recent years. That’s for good reason too, it’s simply stronger than the fiberglass which became the designated material for modern poles. The fact that it’s in four pieces means you’ll be able to easily break it down in order to move it around, and since this is a high-quality rod you really won’t be having to sacrifice any durability once it’s assembled. This rod comes in fly weights ranging from 3-10, making for a versatile pole with which you can get started as soon as you have a matching reel and line. All of them also feature comfortable cork grips, with the ones in the 6+ range having a full grip while the smaller models have a half grip to help save on weight during your outing. This rod is also warrantied for a full year, so your investment has some level of protection behind it. The Okuma SLV series of rods is a fantastic way for the amateur to quickly and easily get into the groove of fly fishing, and will make for a fantastic experience no matter how often you’ve hit the water before. If you’re looking to get into the sport on a budget, this offering from Piscifun will make the absolute best first fly fishing rod you’ll be able to find for under a hundred dollars. It’s a bit shorter than most rods, and it only comes in a couple of weight ranges though so you’ll want to consider things carefully. These rods only come in a 3/4wt and a 5/6wt model, so they’re not exactly suitable for the largest fish you might want to angle for. The quality of the rod itself is exceptional, though, including ceramic line guides and graphite construction so it will be sure to last provided that you don’t decide to just abuse it. For the money, this rod is an absolute win. If you’re just looking to give everything a shot, you’ll be likely to find that the money spent on this rod and a suitable reel will be one of the greatest investments you’ve ever made. That said, people with more experience may want to look around a bit more and find something a bit more specialized and higher quality. There’s not much more to say here, except that this Piscifun rod is probably the rod to get if you want to get into the world of fly fishing. Orvis makes some of the best fly fishing equipment around, and this rod is certainly no exception. It stands right in the range you want for middle sized freshwater fish, and the quality of the rod will quickly overlay the higher price in your mind. The rod has a twenty-five-year guarantee, that is to say, it is guaranteed for a quarter of a century. Almost no other manufacturer will come anywhere close to that, and it shows that Orvis has an amazing amount of faith in their products. Between the cork handle and the attractive green color, this rod is also an eye-catcher. The entire thing seems to be styled towards that perfect dream of fly fishing in creeks, and that’s just a bonus on top of being a massively functional rod. This isn’t the best of Orvis’ offerings, but it’s definitely one of the best rods you’ll be able to find anywhere for the money. 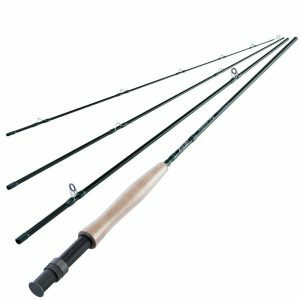 This rod will make your fly fishing dreams come true, all you’ll need to do is spend a little bit more. 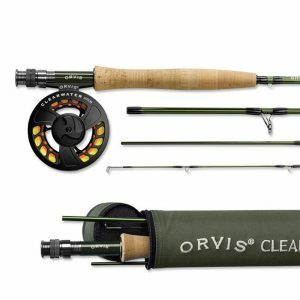 The Orvis Clearwater is the real standout amongst these products, and the action and weight are absolutely perfect for someone who just wants to get into the sport as quickly and easily as possible. Those who prefer a wider range of options, however, may want to take a closer look at the Okuma SLV rods and those on a tight budget can’t go wrong with the Piscifun option. All make a solid addition to your tackle, it’s just a matter of what exactly you want. We hope we’ve been able to help you find a clear entry into a whole new realm of fantastic fly fishing with this rod selection guide. It’s one of the most iconic sports of the broader world of angling, but unique in the look, feel, and equipment utilized. As you can see, if you’re even mildly curious there’re options for anglers on any budget, so why hesitate? Order one now and begin your own special, angling adventure.